Last month I had the pleasure of accompanying my travel writer daughter, Alyssa Schwartz, on a culinary tour of North Carolina’s Research Triangle –Chapel Hill, Raleigh and Durham. Farm-to-table eateries are a real focus here and as it was tomato season, we were indeed in tomato heaven. We sampled them in one form or another – from fried green tomatoes to heirloom salads – at almost every meal. 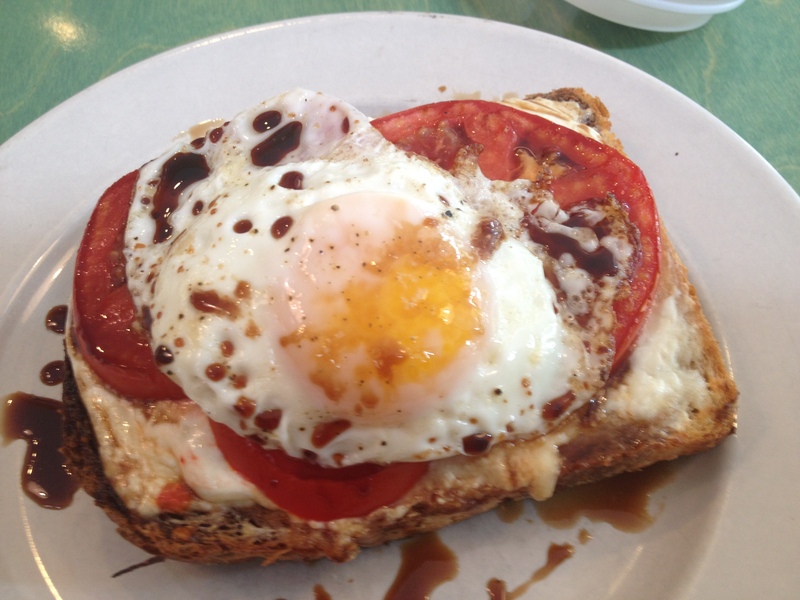 Here’s an example of one dish we loved at breakfast from Scratch Bakery in Durham. The owner and chef, Phoebe Lawless, is a recent semi-finalist for a James Beard Award. This recipe, an adaptation, is for one but you can double or triple it. And consider that it’s a breakfast offering with choices from 3 out of four food groups – unlike those mentioned in my previous post on breakfast skipping earlier this week. Spread ricotta cheese on warm toast. Place roasted tomato slices on top of the cheese and top with the egg. Season with salt and pepper. Drizzle with balsamic vinegar. While this is fabulous with local tomatoes, roasting tomatoes at any time of year brings out their sweetness. 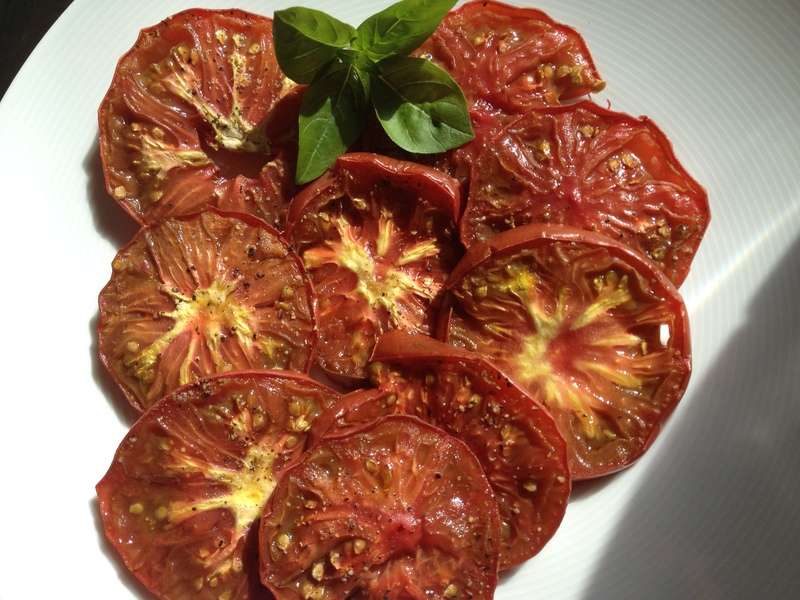 I used Black Krim tomatoes from my backyard– wow! The slices are also great as a side dish at any meal. You can make them ahead and keep them in the fridge for the sandwich. Just bring them to room temperature, if possible, for the above recipe. Line a baking sheet with foil for a quick clean up. Place a rack over the sheet. Slice the tomatoes, horizontally, into 1/2-inch slices (about 3-4 per tomato) . Place the slices on the rack (cut side up for outer parts of the tomatoes) Drizzle the tomatoes with the olive oil and season with salt and pepper. Roast the tomatoes for 1 hour. Remove the tomatoes from the oven and if serving immediately, place them on a serving plate. If making ahead, place in a single layer on a plate and refrigerate, covered.